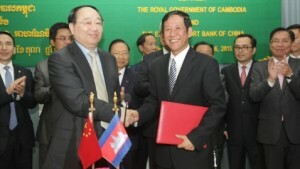 The Export-Import Bank of China (Exim Bank) on Wednesday signed an agreement to fund a $1.67 billion loan to build a Cambodian oil refinery. The deal was signed by Exim Bank’s Chairman Li Ruogu and Hann Khieng President of local project partner Cambodian Petrochemical Company. The Cambodian petrochemical firm and several Chinese companies signed a Memorandum of Understanding in April to jointly build the five million tonne oil refinery project in Cambodia. “The project will be hugely contributing to developing the economy and reducing poverty when it comes to fruition,” said Cambodia’s Deputy Prime Minister Keat Chhon who was present at the signing. China has become Cambodia’s largest lender with a total of $9.17 billion of investment in the last 18 years, according to a government report released in February this year. Cambodian Prime Minister Hun Sen on Monday urged China Petroleum & Chemical Corporation (Sinopec Corp), the world’s fourth-largest oil producer, to expedite the process to build the oil refinery by 2018, according to a spokesperson. “Prime minister Hun Sen supported the project and urged the company to construct the oil refinery as soon as possible in order to enable Cambodia to produce oil by the latest 2018,” Eang Sophallet, spokesperson for Hun Sen, told reporters after the meeting. “The premier also advised the firm to reduce impact on environment as much as possible,” added the spokesperson. Cambodia and China have traditional ties that were further strengthened during the Cambodian prime minister’s visit to Beijing in April. China pledged an additional $548 million in aid to Cambodia for infrastructure and irrigation systems, extending earlier long-standing assistance to its ASEAN (Association of Southeast Asian Nations) ally.